Stylus' for your iPad are two a penny. They normally consist of a metal or plastic rod with a rubberised tip on the end to let you draw on your iPad screen like you would a notepad, while at the same time convincing the iPad that it is in fact your finger not bit of rubber. The Pogo Connect, aims to be different. It connects via Bluetooth to give you pressure sensitive support and a couple of other tricks at the same time, but it is worth the huge premium its makers place on it? We got drawing to find out. The design is incredibly simple. 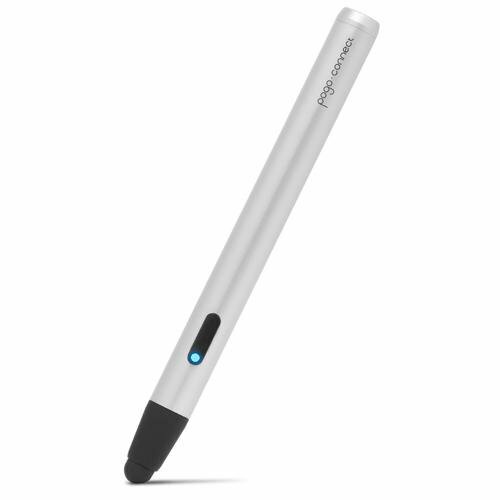 The Pogo Connect is a aluminium rod about the thickness of a AA battery with a removable rubber tip at one end, and a button near the tip that not only lets you connect it to your iPad, but also acts as a secondary command in some apps. While the tip is replaceable, you can't just switch it out for a different style tip at the moment. The Pogo Connect is as thick as it is, because it holds a AAA battery within the design to power it. That's sadly a necessity because it needs the Bluetooth capability to connect to your iPad via Bluetooth. It does mean however that it is not the most comfortable of pens to hold when it comes to drawing with the added weight of the battery making it heavy compared to "dumber" pens on the market. Think felt-tip pen rather than your trusty Biro or fountain pen. You definitely can't put it behind your ear. That's not the only complaint, with no included clip within the design of the stylus, you can't clip it to your iPad's cover (you know you have one). Setting up the Pogo Connect is easy. Although it connects to your iPad via Bluetooth it does not connect via the standard Bluetooth menu in the settings panel. Instead you either have connect the device via a dedicated app (once only) or via one of the 13 apps that the pen works with - Photoshop Touch, Paper, and others. Slot in a battery, press the button located near the tip (that can also double as an undo button in certain apps, and let the apps do the rest. For those using the Pogo Connect app you can also use the app to then find your pen if you lose it (remember it doesn't have a clip) via a radar feature, and the app lets you know about all the other apps you can use the pen with. If you've got to the point that you are about to invest in a $80 pen for your iPad you already use one of the "supported" apps and you're trying to work out whether the Pogo Connect is worth it. We tested the app with a couple of the supported apps, but our time was mostly spent using Paper. The entire concept of the Pogo Connect is that you can apply pressure that is then replicated on screen, using it like you would a normal pen on a normal piece of paper. In practice this both works and doesn't work. Using it with Paper we had varying results. Connection was easy and painless, however using the Pogo Connect with the app wasn't trouble free. One of the biggest problems is that palm recognition sometimes isn't disabled. Rest your palm on the screen to use the pen as if you would on a note pad and the pen gets confused in the same way a standard non Bluetooth pen does. In the app Paper the response is to rewind what you've just been working on. It gets the pressure sensitive capabilities, just not that you are resting your palm on the screen. In fairness to the Pogo Connect this is the apps fault not the pens, but none of the apps we tried worked as effectively as we had hoped they would. The problem is solved by learning not to place your hand on the screen at the same time of course, but it is a trick you will have to learn rather than one you can bypass, which we (rightly or wrongly) expected. Once you've worked out how to hold the pen without your palm touching the screen you'll have to work out how to hold the pen without accidentally pressing the button that just so happens to be in the best place to be accidentally pressed when you are holding the pen. Had the button been placed fractionally higher up the shaft, it would have worked a treat. Sadly not. Get past all those gripes about holding it (you might not have an issue) and the pressure sensitive elements of the pen work as expected, although again, you will have to learn about how much pressure you need to apply to get a line. Too little and you get frustrated nothing is appearing, too much and you're hopes of a dainty little line will be dashed (not literary of course). The Pogo Connect does bring something that you can't achieve easily with your finger to the drawing experience on the iPad and for that it's worth looking at. If you do opt for the Pogo Connect be prepared that you'll have to invest some time in learning how to use it with the iPad (it only works with the iPad 3, 4, and mini) to get the most out of it. Drawing on the iPad is a very different experience to drawing on paper and failing to realise this will lead to disappointment. The Pogo Connect is by no means perfect and for the money we would have expected something a lot, lot better - hindered slightly by the apps available and the support they offer. Hopefully that will change in the future. If pressure sensitive drawing isn't on your list of must haves then the Pogo Connect won't be for you, but it if is, then blades of grass have never looked so good.